Alhamdulillah, we’ve been sharing many tips and resources on how you can work better and be a truly productive Muslim. Now it’s your turn to help our readers! 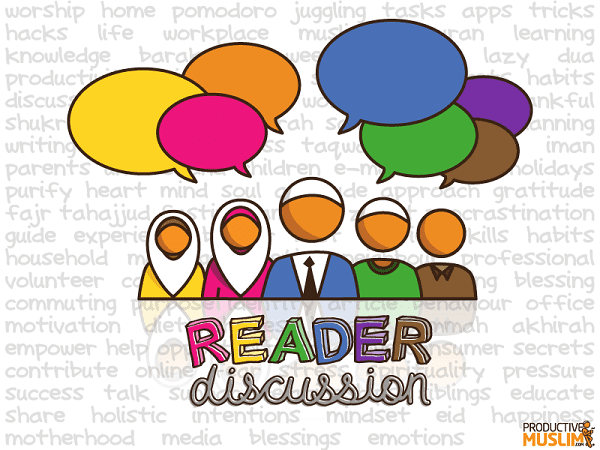 Every month, we will host a Productive Muslim’s reader discussion thread where you can share and learn from each other tips that help you become more productive. Thank you for the many interesting opinions and tips on last month’s discussion on your favourite e-mail hacks! The theme for this month is productivity when you’re ill.
May Allah grant you all good health and long life for productive use. However, we do tend to fall ill from time to time. Whether it’s a brief knock out like the common cold, or something long-lasting and more of a trial, these sick days can easily slip by without much attained. Rest and recovery go hand in hand, but being the productivity ninjas that you are, do you still find a way to make this time beneficial for yourself and for others? We’ve talked about being a productive patient before. Now we want to ask YOU! Do share your thoughts below!